The Shichahai area is the ideal destination. It is located situated in the west of old Beijing. It used to be part of the old Grand Canal of the Yuan Dynasty 600 years ago. And now it is circled by the former palaces of ministers, temples, well-kept Siheyuans (quadrangle) as well as residences of celebrities in the past. Shichahai area still has the ambience of an ancient city, despite its modern setting. Its lake waters ripple and glitter around the many lotuses floating on its surface. Willows line the bank like a misty green curtain, as a trickle of people cross the 1,000-year-old bridge. The lakeshore is packed with young people chatting, drinking and generally relaxing as wood pigeons coo overhead. The place is well known a night spot as eastern Beijing’s Sanlitun bar street in the embassy district. The view from Shichahai bar resembles a watercolor. “Shichahai” literally means “ten temple lakes”. 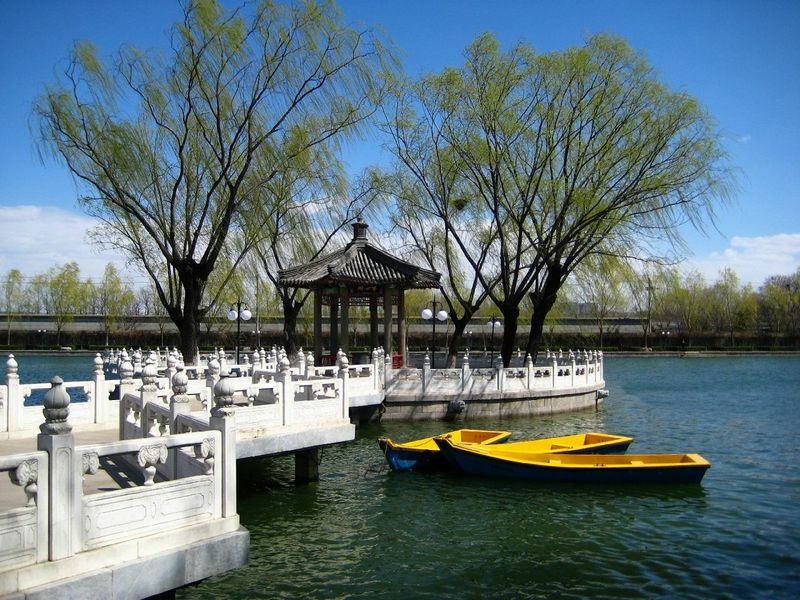 Shichahai area oe Shichahai Lake is also the name of three connectd lakes – Qian Hai Lake, Houhai Lake and Xihai Lake. It used to be 10 temples around the lakes, hence Shichahai Lake. The Silver Ingot Bridge ( Yinding Bridge ), a narrow channel joining Qianhai Lake and the Houhai Lake, the hub of Shichhai area with surrounding quiet hutongs. Lots of pubs or bars are built along the three lakes, making the area one of Beijing’s most favorite night fun place.